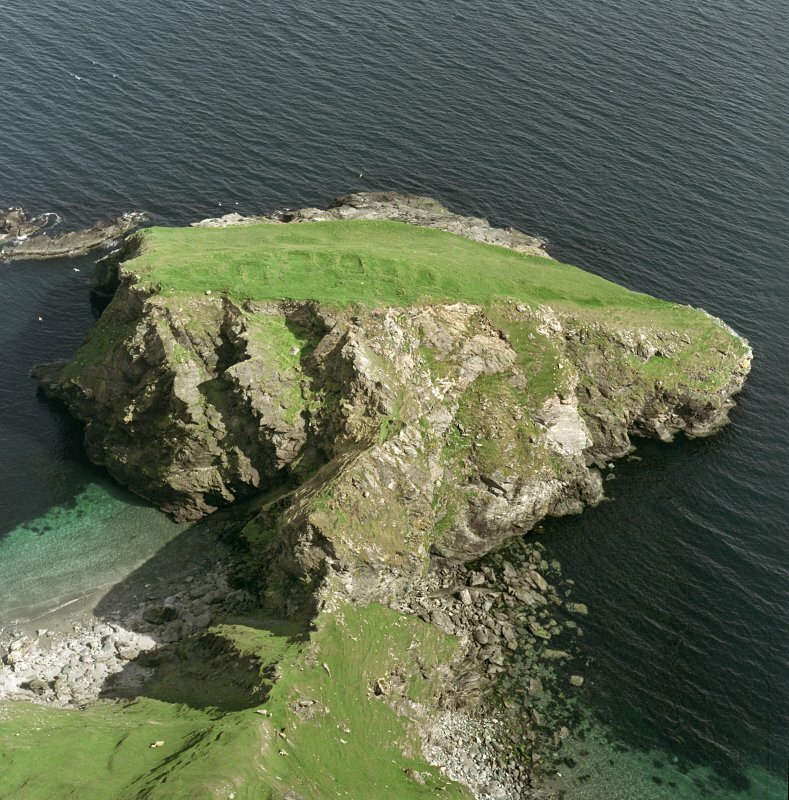 Scanned image of oblique aerial view centred on the remains of the monastic settlement, taken from the NNW. Oblique aerial view centred on the remains of the monastic settlement, taken from the S.
Oblique aerial view centred on the remains of the monastic settlement, taken from the ENE. Oblique aerial view centred on the remains of the monastic settlement, taken from the NW. Oblique aerial view centred on the remains of the monastic settlement, taken from the NE. Oblique aerial view centred on the remains of the monastic settlement, taken from the NNE. 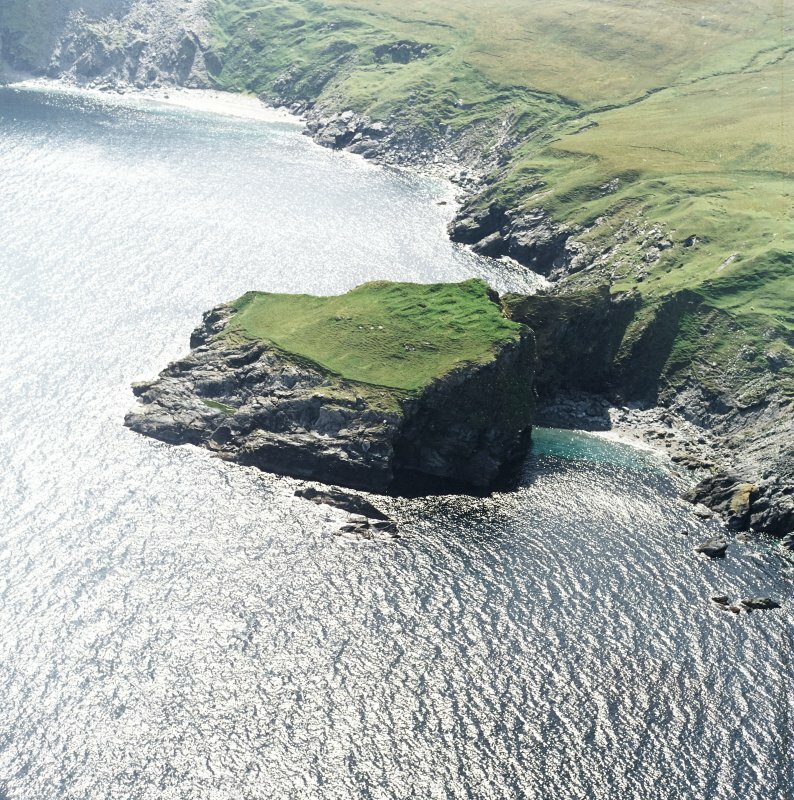 Near vertical aerial view centred on the remains of the monastic settlement, taken from the N.
Oblique aerial view centred on the remains of the monastic settlement, taken from the SSE. Oblique aerial view centred on the remains of the monastic settlement, taken from the E.
Oblique aerial view centred on the remains of the monastic settlement, taken from the W.
Oblique aerial view centred on the remains of the monastic settlement, taken from the NNW. Oblique aerial view of the remains of the monastic settlement, taken from the ENE. 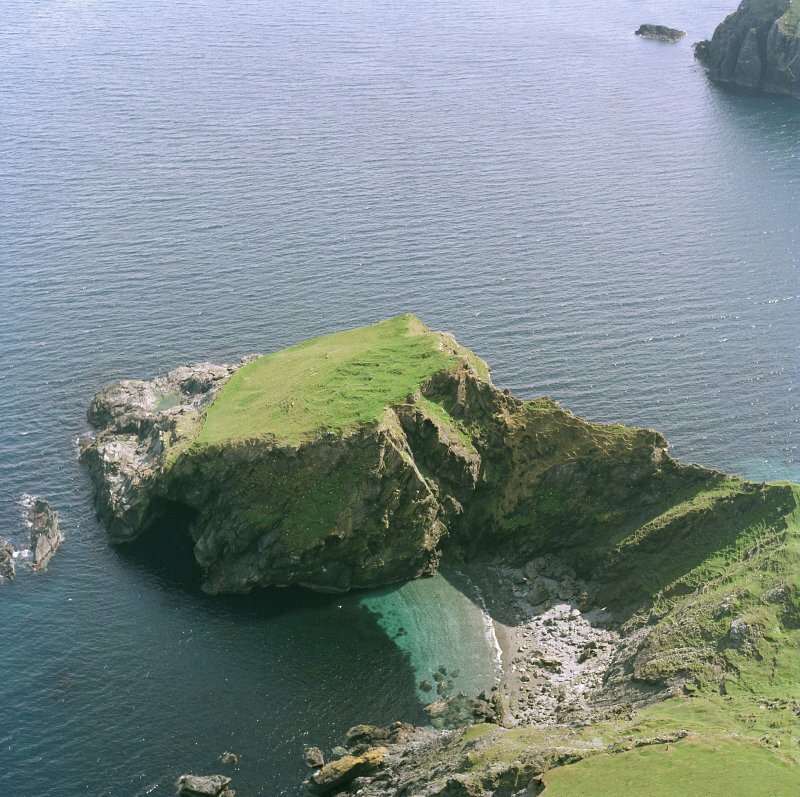 View from the cliffs to the SW.
Oblique aerial view of the remains of the monastic settlement, taken from the W.
The Kame of Isbister, a rock stack of mica slate with a covering of clay, attains a maximum height of 38m. and encloses an area some 95m N-S by 55m transversely which slopes steeply from E-W. 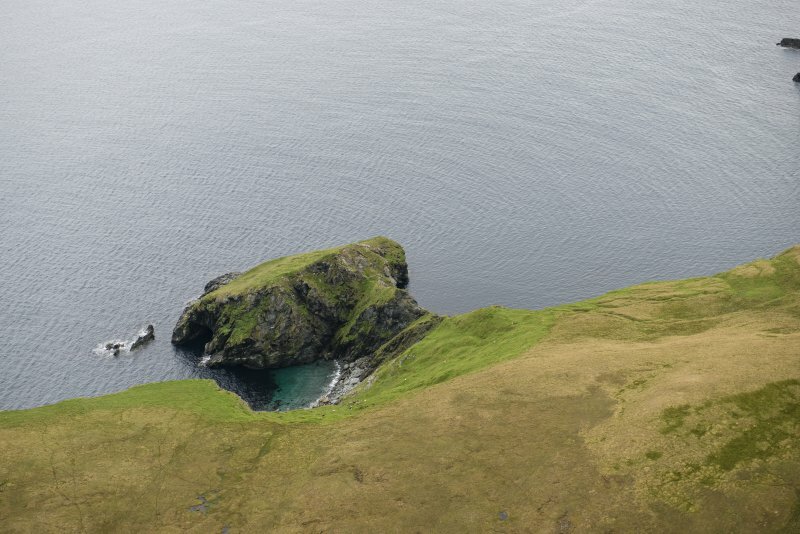 It is joined to the mainland by a knife-edge ridge, half way along which a rocky boss now denies access. 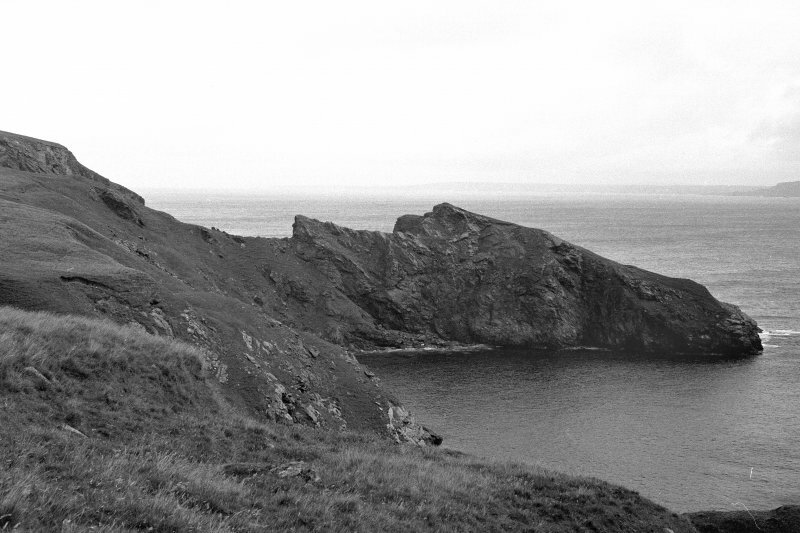 It is recorded that a footpath formerly traversed the ridge, but this has since been eroded by cliff falls. When Cockburn (G Gordon 1878) visited the site in 1876, he noted 23 buildings constructed of earth and stone, set into the steep slope, and measuring from 10-24' in length and 8-10' in breadth. In a majority of cases the doors faced SE., but this was purely a matter of convenience. He dug trenches into two of the houses, but found only ashes, fire-marked stones, and the remains of a 'nail or some instrument of iron.' There were no bones or shells. It was not possible to visit the site, but examination from the air and of air-photographs confirmed Cockburn's description, except that only 19 buildings could be identified. 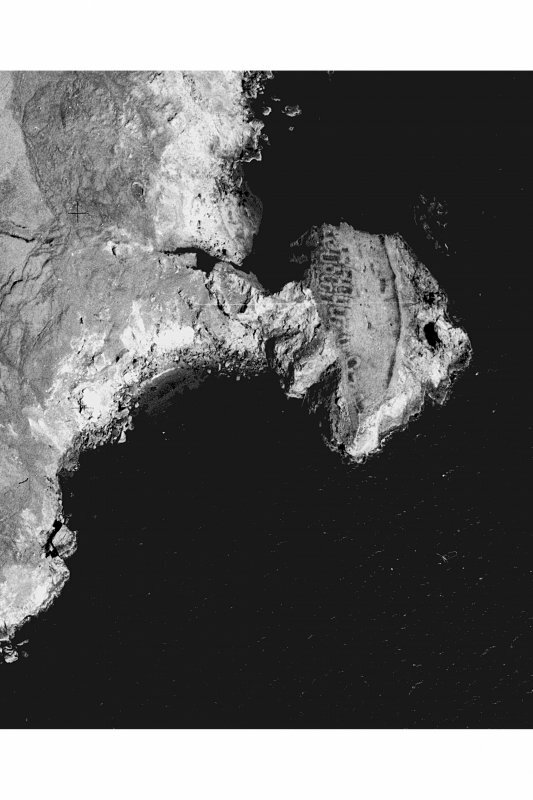 In addition traces of a wall could be seen along the lower, seaward, side of the stack. 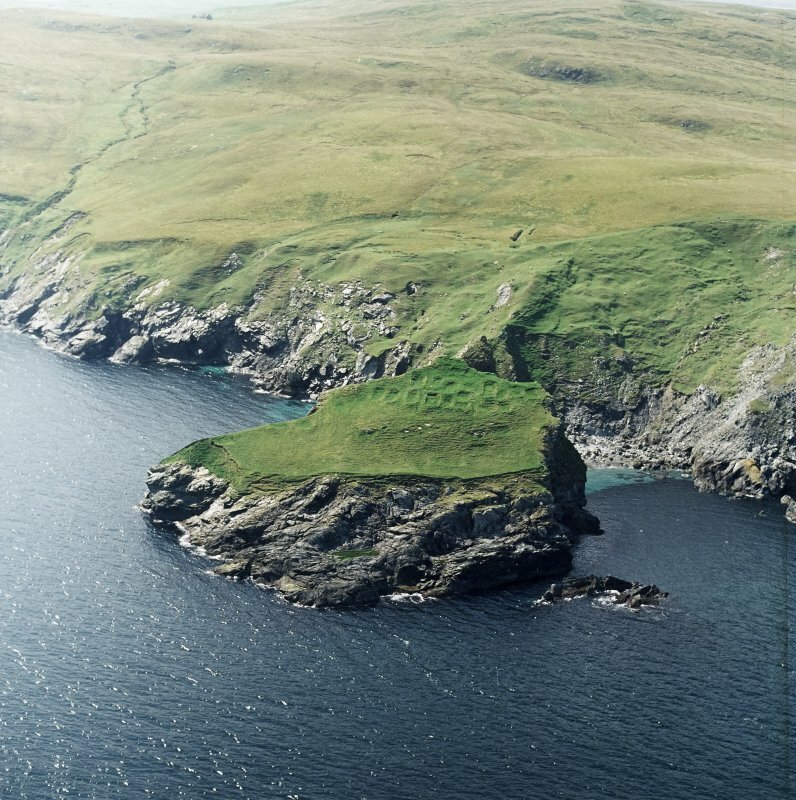 Cockburn refuted earlier suggestions that it was the site of a broch, commented on the similarity of the houses to those erected by Shetland fishermen in his day, and drew comparisons with the seasonal fishing station at Fethaland (HU 375943). An examination of the ruined buildings at Fethaland, however, revealed that they are not comparable in either plan or construction. 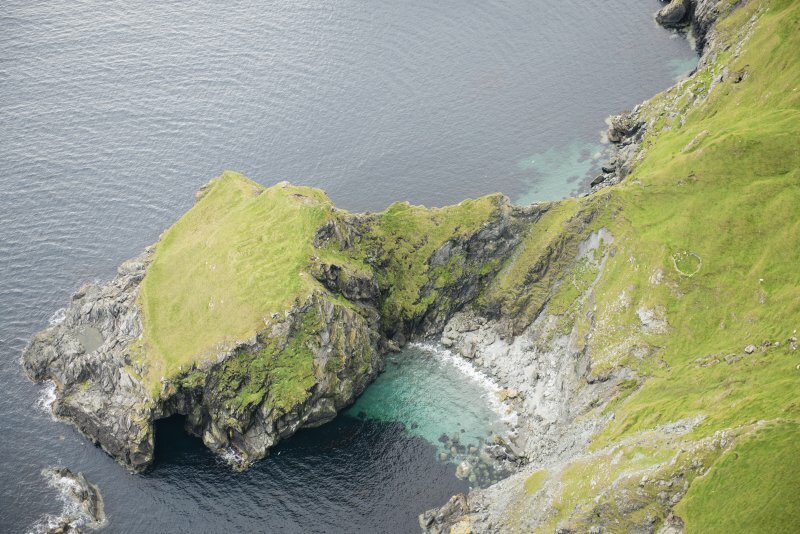 Also, the Kame of Isbister, a virtually inaccessible, exposed, rock stack is a situation no sensible fishermen would choose, and there are no suitable harbours nearby. 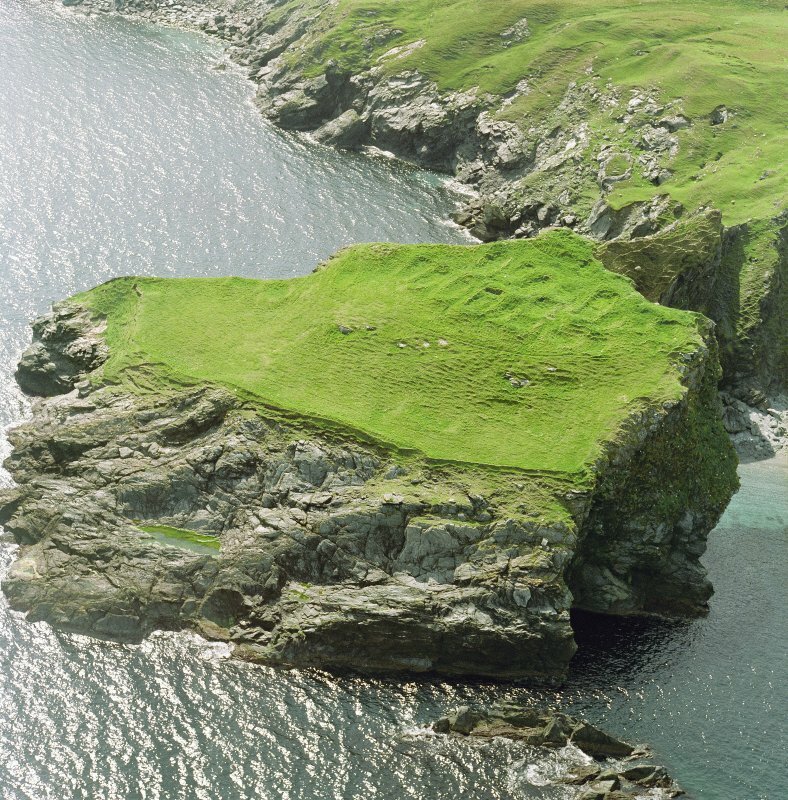 The possibility that it was a Viking settlement can be discounted for the same reasons. The site has clearly been selected for purposes of refuge and isolation - it is effectively screened from the land - and the obvious need for privacy provides a clue to its identity. 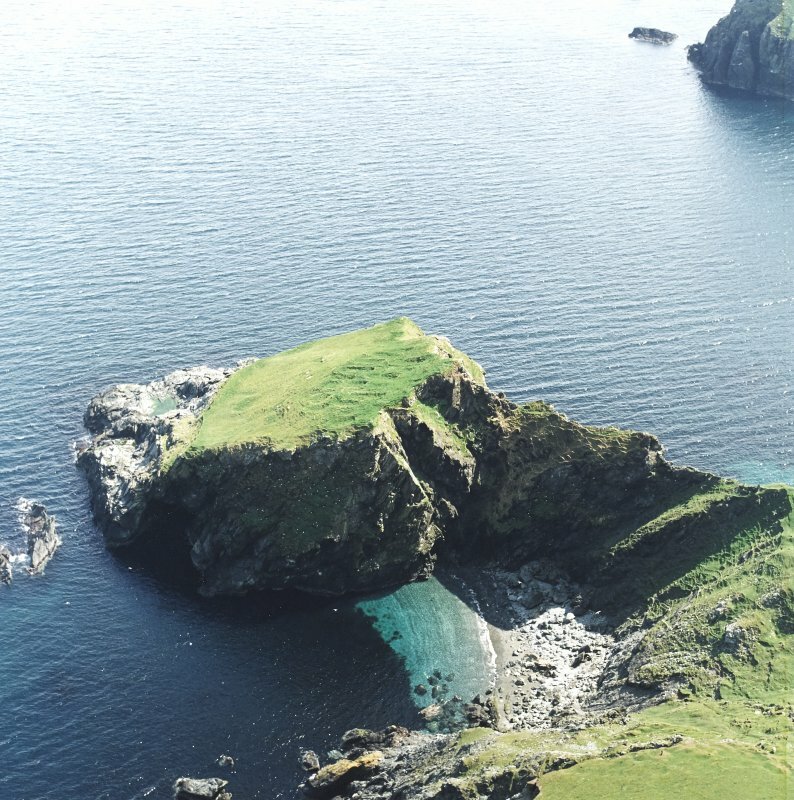 There is documentary evidence that Irish missionaries reached the Northern Isles in the 7-8th centuries AD. 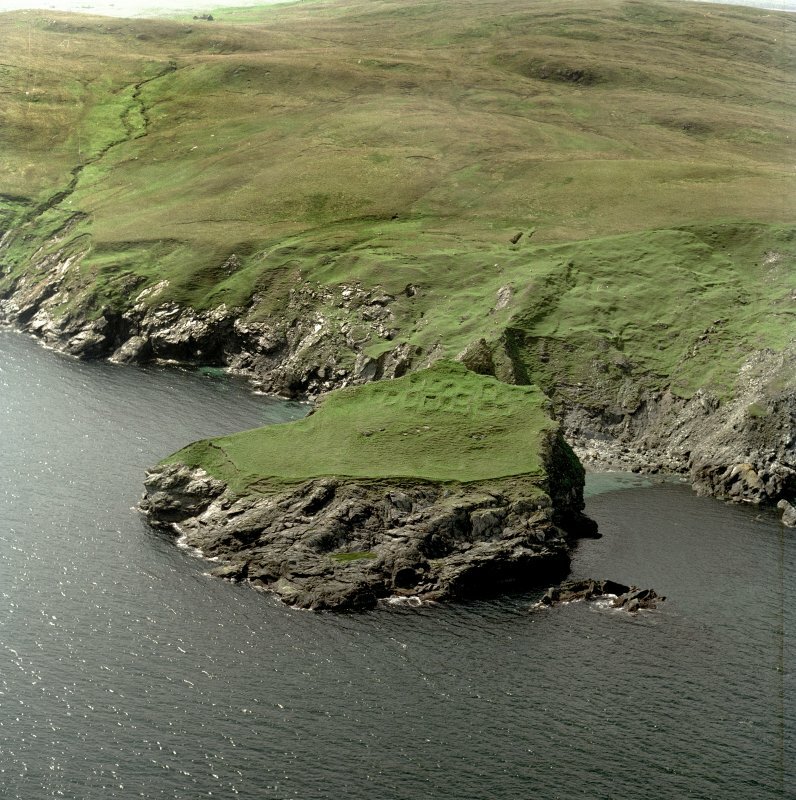 The organisation of the Celtic church was primarily monastic in character, and the monasteries were located in many cases in lonely inaccessible places such as off-shore islands or cliff-girt promontories or headlands sealed off from the landward side by a stout drystone wall - the vallum monasterii' - which served not only to enclose the monastery, but as a symbolic barrier excluding the outside world. Surveyed at 1/10000; enlargement at 1/1250. The Kame of Isbister is a rugged coastal promontory with a distinctive sloping profile dropping down seaward from the rocky crest overlooking the narrow neck. It was formerly approached along the razor-backed spine of the neck, where access was impeded by a natural boss of rock, from which the outcrops rose to form a natural rampart along the crest of the promontory. 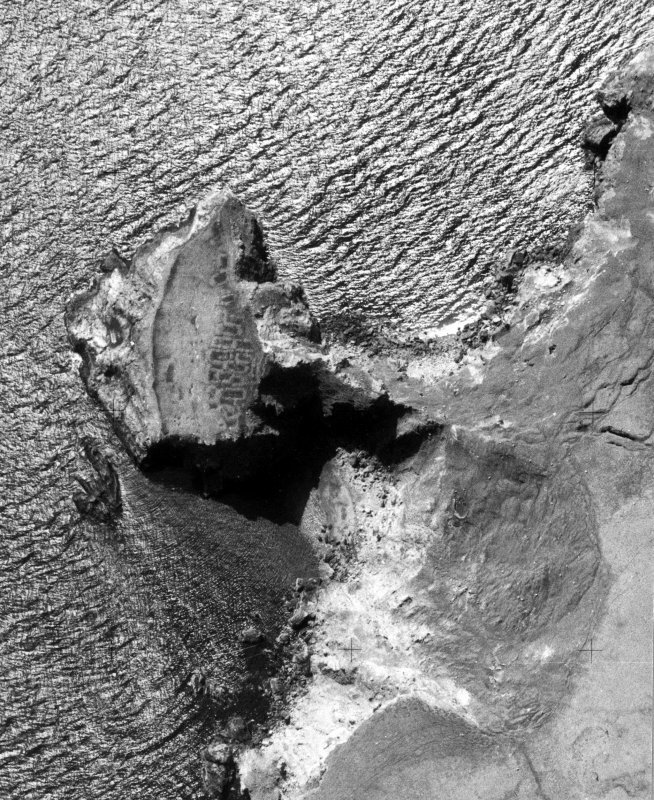 There is no record of any artificial works or defences, but the natural character of the topography is sufficiently difficult to justify its inclusion with other coastal fortifications on promontories; indeed, continued erosion along the neck has now rendered the promontory inaccessible to any casual visit. 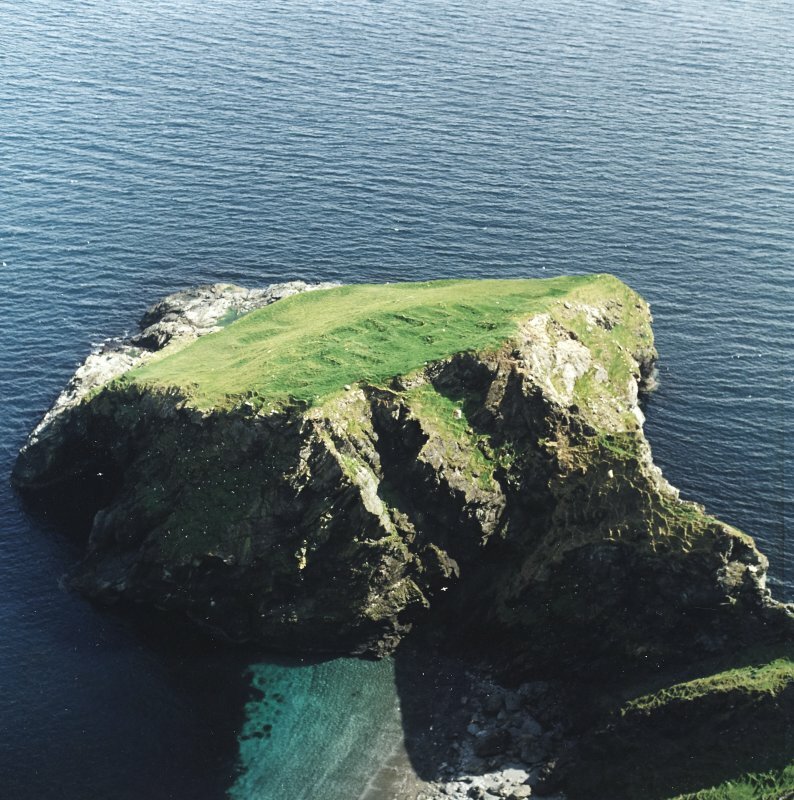 Behind the rocky crest, the ground on the E drops down towards the sea, the upper portion being grass-grown and measuring 90m from N to S by up to 38m transversely (0.25ha), beyond which the sloping outcrops drop a further 40m down to the sea. 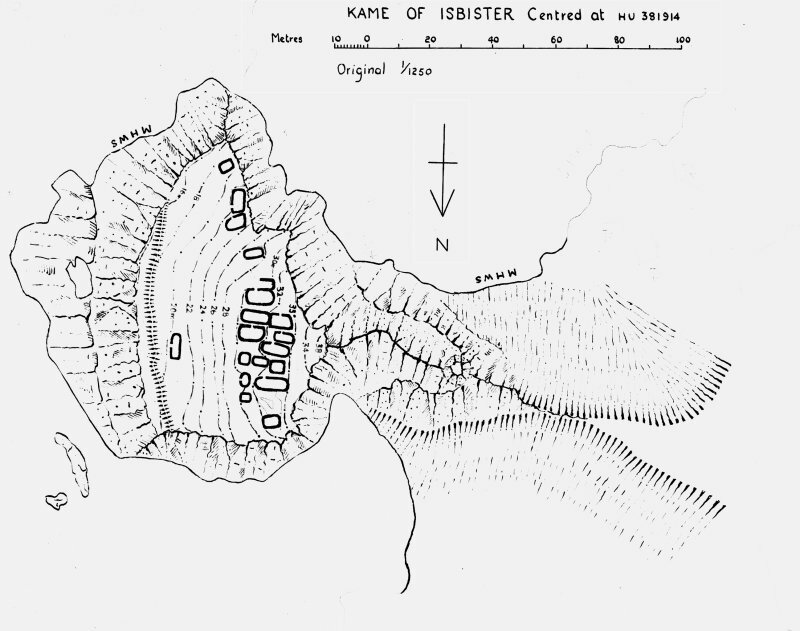 In 1876, George Cockburn counted no fewer than twenty-three rectangular buildings on the grassy slope, excavating in two of them (Gordon 1878), while a plan drawn up by the OS in 1970 shows nineteen, the majority of them set side by side along the upper margin immediately below the crest of the promontory. 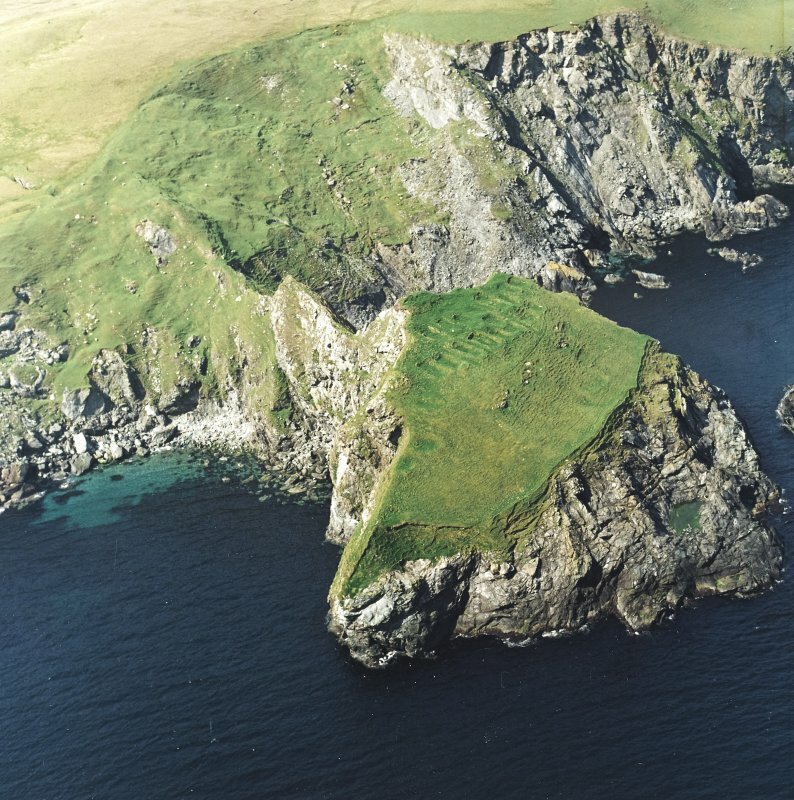 While it was suggested in the 19th century that this may be a relatively recent fishing station, the isolation and difficulties of access, coupled with analogies elsewhere in the Northern Isles suggests an early medieval monastic origin (Lamb 1973; 1976). 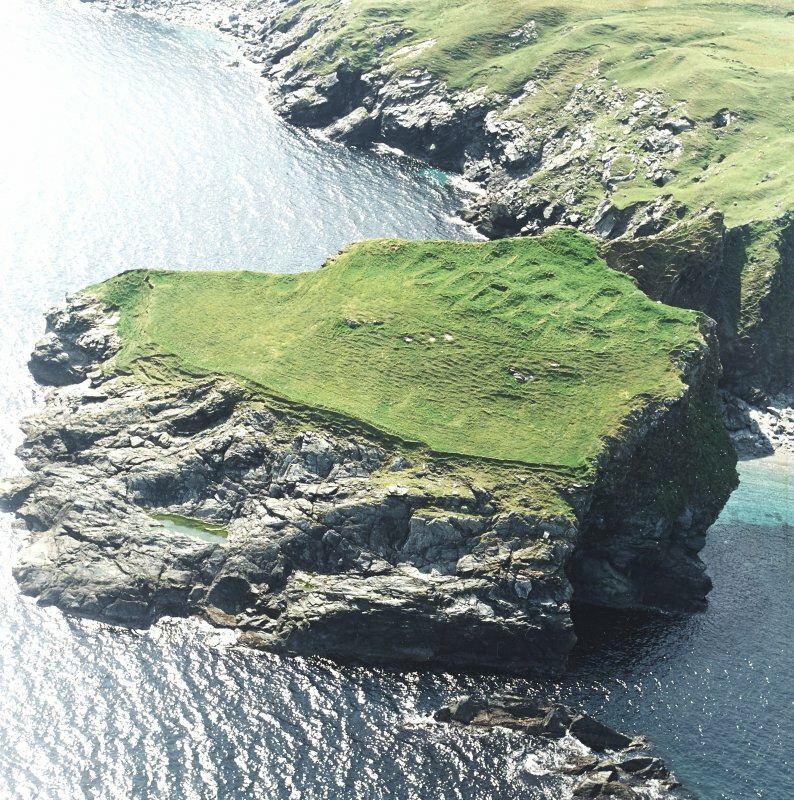 The monastic settlement at Kame of Isbister consists of at least 19 small stone buildings perched on top of a precarious sea stack. 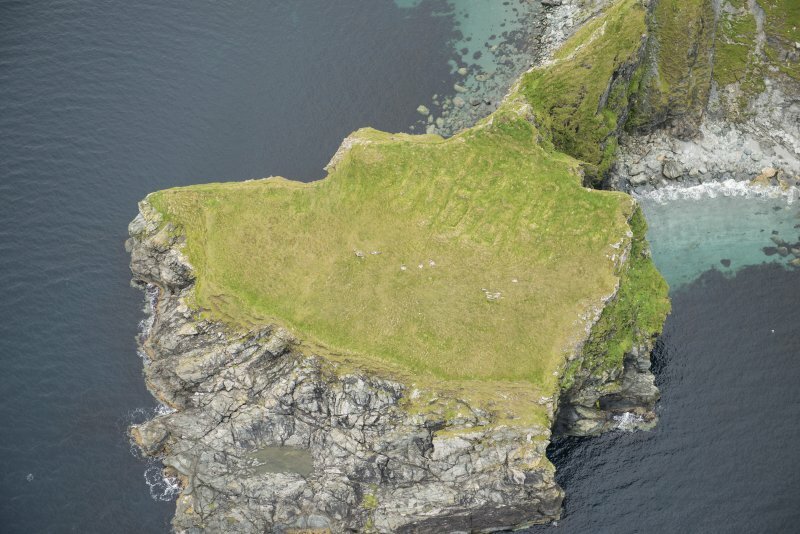 An archaeological excavation in 2003 recovered material that was radiocarbon dated to c.860 AD, falling into a period in Shetland that can be described as Late Pictish or Norse. Have you ever found yourself falling towards a rocky shore, with only a rope to stop you? That’s what happened when I went to visit the Kame of Isbister. 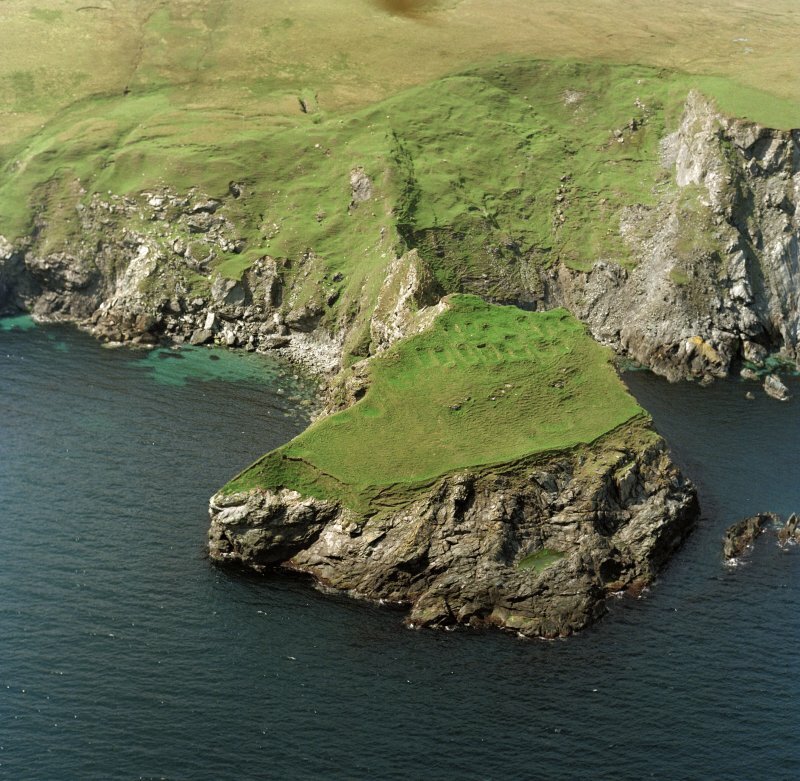 The site is on top of a sea-stack, connected to Shetland Mainland by a knife-edge ridge. Luckily I was with a rope team and even though they were looking away when I fell off the ridge, I was safe. Access to the stack could never have been easy, even at the time it was occupied. 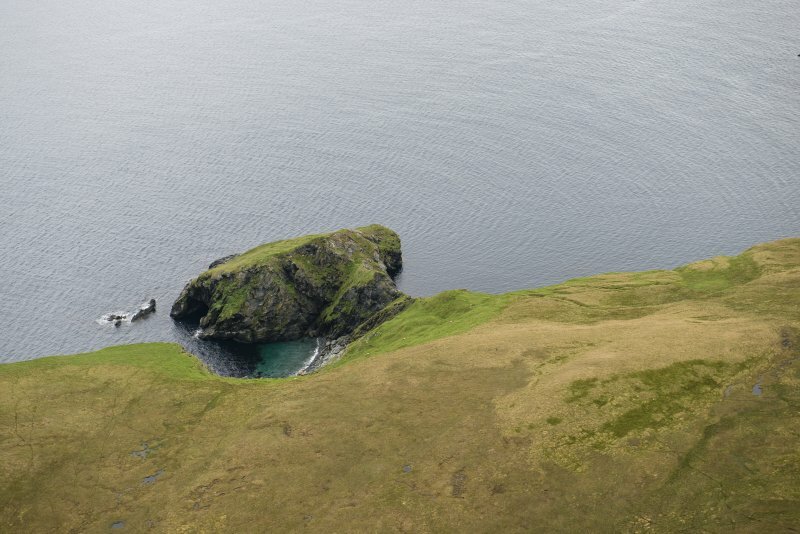 The ground of the stack is not flat, but slopes away from the mainland to Yell Sound, and there is a bank along its east side above the cliff below. Curiously, there is a very similar site at Birrier of West Sandwick, on the other side of the Sound. Today there are 19 stone buildings packed closely together. They range between 3m and 8m in length internally. Back in 1876, when the site was visited by George Cockburn, a student in divinity from Aberdeen, he reported seeing 23 little buildings and interpreted them as fishing station. Perhaps the ones closest to the cliff edge have crumbled into the sea by now. During the early 1970s the site was reinterpreted and mapped. 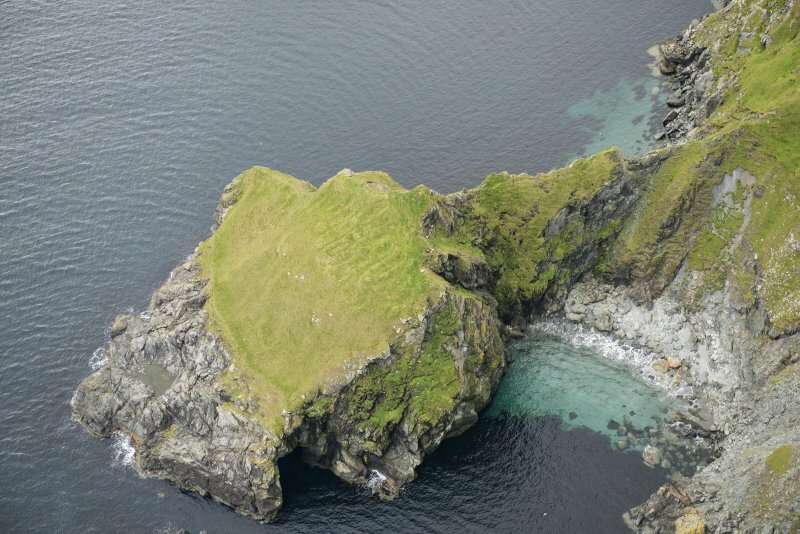 It is so remote and hard of access that an interpretation as a fishing station seemed problematic and both the Ordnance Survey’s Archaeology Division and Dr Raymond Lamb advanced the possibility that is was an early monastic settlement. Yet how did people get supplies there and where from? How could the economy have worked? An archaeological team from Extreme Archaeology, a spin off from Time Team, undertook a small excavation in 2003 but did not recover any finds (Cockburn opened two small trenches in 1876 finding ashes, fire-marked stones and a ‘nail or some instrument of iron’). But the most recent excavation did recover material for radiocarbon dating, and a date of c.860 AD seems to support the assessment made in the early 1970s. 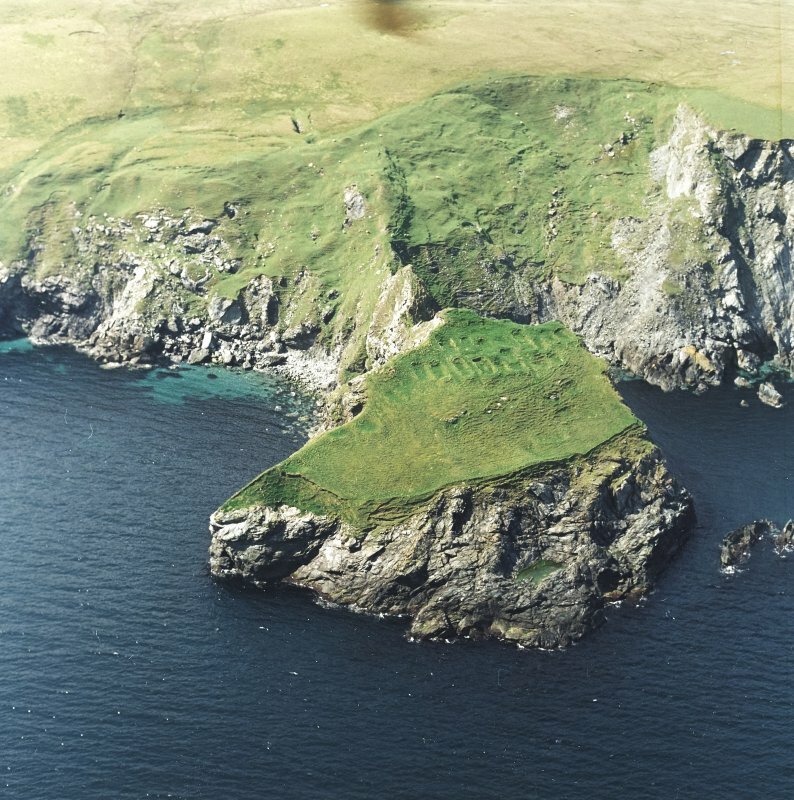 As Lamb noted in 1973, the buildings do not resemble Norse structures, so it may be that this is the site of a Pictish eremetic site. 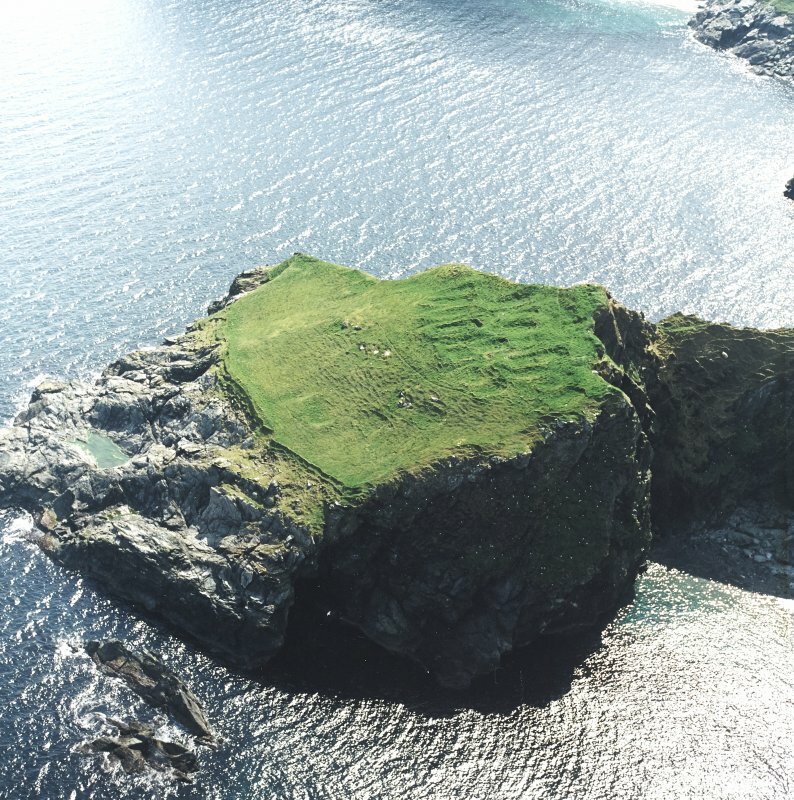 We can even imagine the possibility that this native site was set up, not only to get closer to God, but to avoid the Viking raiders of the time. The Vikings had many gods and perhaps didn’t care about one more, but they had found out from Lindisfarne that Christian monks had treasure! 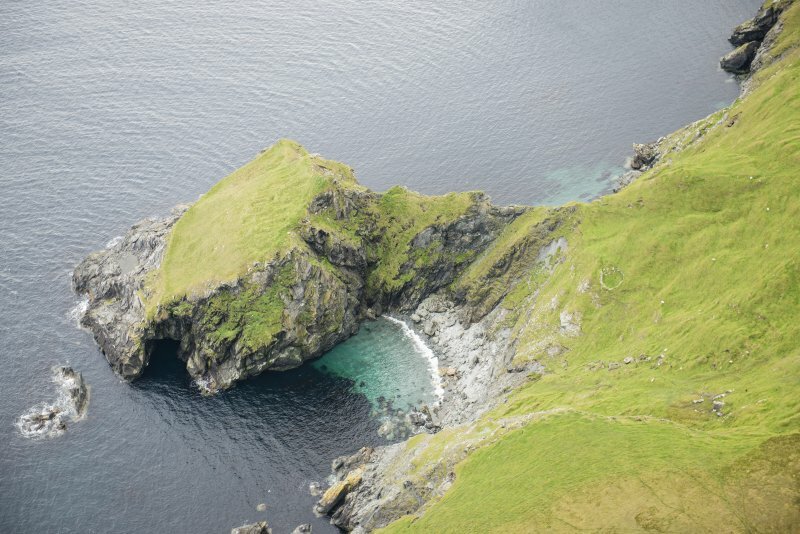 Shetland didn’t become officially Christian until 997 AD – and then only because the Norwegian king said that their alternative was decapitation – not the accepted way to make converts!